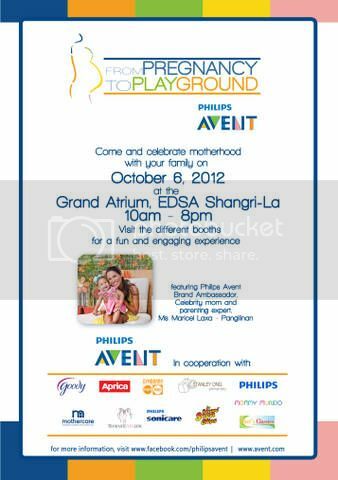 Celebrate the many facets of motherhood tomorrow, October 6, 2012, at the Shangri-La Mall with a one-of-a-kind interactive exhibit , Philips AVENT: From Pregnancy to Playground. The exhibit will have three areas, namely: Baby Bump for pregnant moms, New Baby for moms with young children up to 18 months, and Growing Baby for mothers with toddlers. There will also be talks on childbirth and parenting on stage by experts and Philips Avent Brand Ambassador Maricel Laxa-Pangilinan. This entry was posted in From Pregnancy to Playground, Philips AVENT, Shagri-La Mall. Bookmark the permalink. Nice to see you at the event last Saturday. I enjoyed the part of the program when Maricel Laxa shared some parenting tips.